Washington Life Magazine: December 2005: Osama bin Where? Four years before 9/11, CNN terrorism analyst Peter Bergen gained firsthand insight into the threat Osama Bin Laden posed to the United States when he produced the first television interview with the elusive al-Qaeda leader. Bergen’s first book,“Holy War, Inc.: Inside the Secret World of Bin Laden,” published just after the 2001 attacks, was reviewed by The Washington Post as “the only book you need to read about Osama bin Laden.” In January, Bergen will release “The Osama bin Laden I Know: An Oral History of al-Qaeda’s Leader.” Bergen often crossed paths with The Washington Post reporter N.C. Aizenman, who has just concluded a year-long tour as the paper’s Afghanistan Correspondent With Aizenman back in Washington, the two longtime friends recently met to discuss what Bergen uncovered about a man who remains as mysterious as he is dangerous. N.C. Aizenman: So Peter, why did you decide to write this book now? 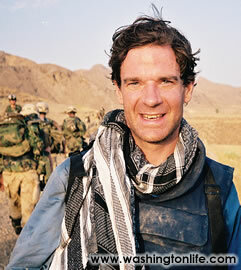 Peter Bergen: Lately the attention has drifted away from Osama bin Laden and it is important to bring it back. Justice for the victims of 9/11 demands it. But bin Laden also continues to influence events. His statements— including specific instructions to his followers—continue to be shared around the world. An example of his enduring importance is Abu Musab Zarqawi, the main insurgent leader in Iraq, who is now saying he is part of al-Qaeda. The attacks in Madrid in 2004 and London last summer are also direct results of things bin Laden has said about attacking members of the coalition that were in Iraq. The notion that he has been sidelined is ludicrous. Every time he comes out with a tape it is broadcast on every network around the world. Hundreds of millions of people hear these messages. So, I thought it was important to bring the focus back on this guy who founded al-Qaeda and to get a better handle on who he is. There was not a lot of information out there about him. NCA: Instead of writing a biography of bin Laden, you have woven together first person accounts from a wide array of people who knew bin Laden personally to create an oral history. Why did you choose to present the material this way? PB: A tsunami of nonsense has been written about bin Laden. Rather than relying on secondhand accounts, I thought people should be given the chance to form their own conclusions based on firsthand accounts from bin Laden’s brothers, his high school buddies, his university classmates and his companions in arms. There were two guiding principles to the book: The first was that we only hear from people who know bin Laden personally. The second was that we hear from them directly—with a little bit of setting up from me, of course—but basically in their own words. I was influenced by a book about Edie Sedgwick, a 1960’s supermodel who became a sort of Andy Warhol superstar. The book was by George Plimpton and edited by Jean Stein, and it always struck me as a very good account of what was going on in New York in the ’60s. Obviously bin Laden and al-Qaeda are a rather more serious and more complicated subject. However, I thought that using direct testimony from people who know bin Laden is perhaps a way of similarly recapturing some worlds that most people don’t have much experience in. NCA: What are some of those worlds? PB: Well, there’s the rarefied atmosphere of Saudi Arabia in the 1970s, where bin Laden grew up as a member of an educated elite. There’s Peshawar, Pakistan, in the 1980s, a sort of South Asian Casablanca [where] bin Laden and other Arab supporters were funneling money and weapons across the border into Afghanistan to the Afghans fighting the Soviet Union. Then there’s the world inside al-Qaeda itself. Hearing directly from the people involved gives you a real sense of what people were saying to one another and what people were thinking. What was it like, for instance, for bin Laden, who ultimately took up arms himself, to personally fight the Soviet Union? I think you get a sense of that. You also get a sense of the places where bin Laden spent time. I’m speaking, of course, of bin Laden’s house in Kabul— which Peter Jouvenal, the British cameraman and journalist who interviewed bin Laden with me in March of 1997, took over after the fall of the Taliban and turned into a guesthouse. PB: Did you sleep in the bin Laden memorial bedroom? NCA: (Laughs) I don’t think we ever established which one was his. PB: It would have been one of the rooms with a bigger bed since he is 6’ 5”. NCA: You have stayed there as well, I know. But you also traveled to a lot of other places to gather material for the book. What were some of the discoveries you made? PB: I tried to go everywhere that bin Laden went. The only place I couldn’t get into was Sudan. In Jeddah, Saudi Arabia, I found that despite his family’s wealth, the neighborhood where bin Laden grew up was actually more of a middleclass place. He did not live in one of the mansions that many of the nouveau riche have built. It gives you a flavor of the guy. I also walked around the Tora Bora mountains on the Afghan-Pakistani border where bin Laden had a camp for many years and through which he fled Afghanistan after the U.S.-led invasion. The camp was a sort of back-to-nature set up—growing your own crops in the mountain at 10,000 feet. Like a hippie commune, except of course, different. Certainly, one of the things I think the book establishes is the fact, pretty much without a doubt, that bin Laden escaped through Tora Bora, despite what members of the Bush Administration said in the run-up to the election. I have bin Laden telling us what happened in the battle at Tora Bora from his own perspective. NCA: You also quote from various original documents— including the minutes of the meeting at which al-Qaeda was founded. What do those documents reveal? PB: Well, we can now date al-Qaeda’s founding to a certain weekend in August of 1988 when these guys got together. They started work on September 10, 1988, and only thirteen years later they managed the 9/11 attacks. NCA: One of the most intriguing sources you found is “Jihad” magazine, a monthly published for several years by the Services Office, the group that was the precursor to al-Qaeda. How did you obtain those back issues and what do they add to the picture of bin Laden and al-Qaeda? PB: Jihad was sort of the in-flight magazine of the Services Office, which bin Laden set up in the mid-1980s. I found the copies in Kabul, ironically enough through the man who was profiled in the well known book, “The Bookseller of Kabul.” As readers of that account will know, the bookseller acted heroically under the Taliban—hiding scores of books to prevent them from being destroyed. But he also treated his family very poorly, especially his first wife. Anyway, it was this bookseller who turned me on to Jihad magazine. He had kept almost all the issues, which dated from 1984 through 1994, for years in a storeroom in Kabul. It was a huge amount of material to translate from Arabic, but it was a great source of contemporaneous information about bin Laden. People’s memories are always faulty. But a contemporaneous account of bin Laden fighting in a battle in Eastern Afghanistan in 1987, at a time when he was basically unknown, I believe we can take as being the real deal and not some post facto attempt to make him look like a hero. It shows that whatever bin Laden is, he is not a coward. He did fight personally against the Soviets. I have lots of eye witnesses talking about this in the book and I also have these contemporaneous accounts from Jihad magazine. NCA: How do the various acquaintances of bin Laden whom you interviewed feel about him now? PB: By and large they have all abandoned him and believe that what he is doing now is so counter-productive--killing all of these civilians and tarring the name of his family. One of the things I found out is that one of his older sons left him after 9/11. Many people who know bin Laden also said that while 9/11 was a tactical success for al-Qaeda, strategically it was a disaster. It blew up the organization and it destroyed the Taliban. Basically without the Iraq war he would be out of business. NCA: As you’ve written, bin Laden comes from an enormous family, and his siblings were presumably exposed to many of the same influences. Why do you think he ended up choosing this path in contrast to so many others in his family? PB: That’s a good question. I think he went down this path because he is motivated by his very strong religious beliefs. He believes that he is doing God’s work. He was sort of a religious zealot from the age of 11 or 12. He was forcing his brothers to get up for morning prayers which, as you know, are before dawn. And then I think his path was guided by several mentors and a series of key decisions at various points. One of these was to go fight in Afghanistan against the Soviets. The experience of fighting with the Soviets directly, I think, changed him dramatically, as war can really change people. He went from being a really mild-mannered guy to a guy who founded al-Qaeda only a few years later. NCA: Did you find evidence of any further evolution in his character since 9/11? NCA: What impact do you think it would have if he were caught? And would the circumstances of his capture make a difference? PB: If he were caught it would be a psychological victory for our side and it would be a psychological blow to theirs—particularly if he were captured and given some of the Saddam Hussein treatment. But, I don’t think he will be caught. He said he is willing to die and I take him at face value. NCA: If he is killed rather than caught what would be the impact? PB: In death I think he would be perhaps an even more important figure than in life. He would certainly be an important martyr for this movement. By the way, when you were there, were there any indications that bin Laden was in Afghanistan? NCA: Well, rumors of this sort are rampant in both Afghanistan and Pakistan. Probably the most widely-held view was that bin Laden is hiding in the tribal area of Pakistan along the border with Afghanistan. There was also an interesting moment in June at the last press conference that then-U.S. Ambassador Zalmay Khalilzad gave the Kabul press corps before leaving to take up the job of ambassador to Iraq. Khalilzad told us quite firmly that he did not believe bin Laden was in Afghanistan. But he did not say where he thought bin Laden was, or what he was basing this view on. So where do you think bin Laden is? 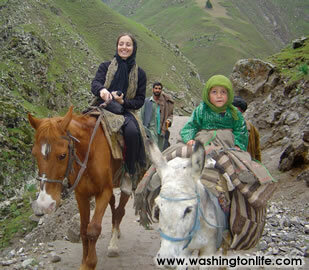 PB: He could be in a small town rather than a remote mountain hideaway in the tribal areas. If you look at the last videotape that came out from bin Laden it was like a Halloween version of an Oval Office address. He was sitting behind a desk. The room was well-lit. His outfit looked like it had been dry-cleaned and he was very well informed about current events. He didn’t look like he was sitting in a cave somewhere. So I think that he is in some smaller, urbanized setting. Not necessarily a big city, but somewhere that has internet access. He looks better now than he did several years ago, in terms of his demeanor, his health. NCA: You already knew a lot about bin Laden before putting this book together. As you conducted interviews and gathered material, was there anything that surprised you? NCA: How have his wives handled this life? PB: Apparently, he is a pretty democratic guy with his wives, and he told them, “Look it’s going to be harsh with me,” and gave them the option to go. One of them took him up on it and left him when they were living in Sudan in the mid 1990s, saying, “I didn’t sign up for this program.” One of the interesting things you learn in the book is that bin Laden used to complain that his Dad had twenty wives— you can have up to four wives under Islam as long as you keep divorcing the last one. He said he was not going to do that. He was going to marry four wives and treat them equally. And they have all stuck with him except for the one I just mentioned. He replaced her with a young Yemeni just before 2001. 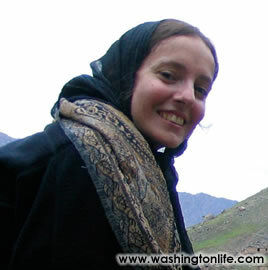 They had a daughter together, Safia, soon afterwards. When his Pakistani biographer—who is quoted in the book—asked bin Laden why he named the girl Safia, he replied that it was because during the Prophet Mohammad’s time Safia killed a lot of Jews. NCA: After all your research, do you feel any closer to truly understanding this man? PB: The more you know about a person, the more puzzling they can sometimes seem. And I am sure that one of the things people will say in criticizing the book is that I am humanizing the guy. But, the last time I checked, the people who attacked us on 9/11 were not robots, they were human. Their boss is a human and I thought it was important to try to understand him more.